Edited by Maurice at 11:07, 25 Nov 2018. Mod edit: Original content & thread subject removed and replaced, by request of the OP. Its big so if its really the same Ive it ingame. Did a quick analysis with a couple of tools I have that can check whether a sound clip is CD lossless, or a reconverted MP3. Unfortunately they came up with the chance that any of those are the real deal at about 4%. Further, I compared in Audacity one of the files that is advertised as lossless with the matching clip from the game directory. Needless to say, the matching cutoff point at just over 15khz makes it pretty clear it's the same file reconverted into WMA. Even worse, we can see below that the volume was also slightly increased in the so called "lossless" file, and any such manipulation inevitably leads to loss in quality. In conclusion, these files are just a waste of space. They're more likely to have a worse sound quality than the game's files (though I don't expect anyone to hear the difference). Rather the same. Maybe you know if you can analis if in Heroes Chronicles movies we have the same music as in H3 or something new? It needs to extrat only music not a voice. There were no public releases of h3 music in loseless format. Edited by Evaline at 22:15, 02 Feb 2018. This is not entirely true. There were... but only 2 tracks erroneously placed on Heroes II Gold CD from HoMM Millenium Edition released 1999.
posted February 03, 2018 03:43 PM bonus applied by Maurice on 03 Feb 2018. Edited by Alyx182008 at 16:10, 03 Feb 2018. To start it off, as far as the FLAC called "City of Wizard" is concerned, by looking at it's spectogram in Audacity, you can see that the sound goes all the way up to 22khz, without any kind of frequency cut off points that are typical of lossy encoding. So this is indeed a lossless file, and it can be used as a benchmark for what a authentic CD lossless music file should look like. By comparison, the file from the game does have a frequency cut off at about 16khz. Funny enough, this is a common cut off point for MP3 encoding, especially at 128kbps encoding bitrate (which happens to be the exact bitrate Heroes 3's music files are encoded at). Now, let's have some fun and look at your "lossless" file. What's the first thing that we notice? The same frequency cut off at the same 16khz typical of poor MP3 encodings. You mention a bitrate spike of over 2000kbps. First of all, that in itself means nothing. It could be an error in the encoding, it could be a strange particularity in the codec used (WMA isn't exactly the best thing around, even at doing lossless encoding), or it could be an error in whatever tool you used to make that analysis. The latter I find more likely, as when using MediaInfo, it shows me an average bitrate of 666kbps, with a maximum bitrate of 810kbps. Well under your claimed 2000kbps (which is normal for a lossless file format, irrelevant if it's true lossless or reconverted from something like MP3 into lossless). You also say that the "lossless" WMA sounds clearer (personally I would disagree to that, as I find the FLAC to be the clearest). As I mentioned in my previous post, these WMA files are slightly louder than original game files (also louder than the FLAC file). This can easily be a result of editing. What can also be easily done in editing is messing around with the equalizer, enough to maybe correct for some of the frequency cut off, and to give the impression of a better sound. An increase in loudness can also cause sound clipping, which I've seen quite a bit in other of these WMA files, and can be seen in this example near the end. What this suggests to me is that these files don't come from a professional studio or people who actually know how to edit music. If you have some high quality headphones, then I advise you to search on audiophile forums for what ABX testing is and listen very very carefully at the 3 files, the WMA, the FLAC and the MP3. If your headphones aren't that great thought, you're better off getting Audacity (it's a free program) and looking at the file spectograms and trusting those instead, because it's unlikely you'll hear the difference. I've got some experience and somewhat know what to listen for, and I still find it hard to tell a lossy encode from a lossless file at times. I'm not gonna say that these files are for certain the game MP3's reencoded into WMA. They may very well have a different source (although given their filenames I find it hard to believe). But what I am 100% certain of, is they are not in any way lossless. 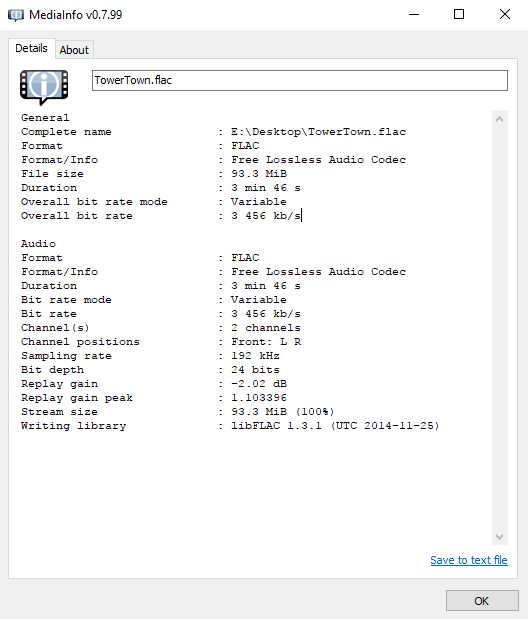 Edit: a few references for 16khz being a typical frequency cut off point for 128kbps MP3 encodings. 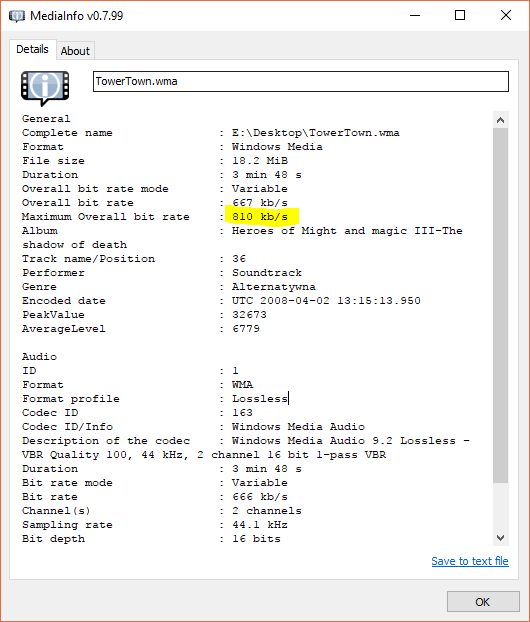 Edit2: as proof that bitrate in itself means nothing, I've taken the game's MP3, and saved it to FLAC in a way to make it look like it has an average bitrate of 3456kbps. I see that after some confusion and discussion, the opening post has been retracted. As such, the topic would lose much of its value. I've been requested by the OP to delete it, but considering the discussion and interesting analysis with regards to conversion and sampling of audio files, I am letting the topic be for now. Agreed. Moreover there is a +QP in the replies so I see no reason to delete the topic ever.